Quite a few years ago, before the kids were born, our neighbors hosted a Halloween costume party for the adults in the neighborhood. We always had fun trying to decide what kind of costume to wear. Unfortunately we moved from the neighborhood and haven't been to many Halloween parties since (besides the ones for our kids.) If we were attending this year, I think we might have went with a "Fawlty Towers" theme just so we could enter the Fawlty Towers Lookalike Contest on Facebook. My husband would make a good Basil Fawlty. The Grand Prize includes a Signed John Cleese Photo, Signed Fawlty Towers DVD, Fawlty Towers embroidered white terry-cloth bathrobe, Fawlty Towers story of Britain’s Favorite Sitcom book and Fawlty Towers corgi toy car. 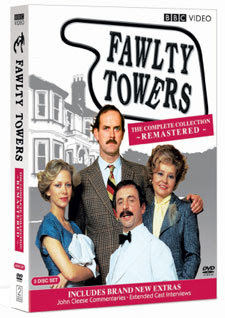 To mark the 30th anniversary of the series, BBC Warner just released a Fawlty Towers remastered DVD set on October 20th. Now I've written about what the kids and I like on my blog but haven't mentioned a whole lot about my husband's favorites. He's been a Monty Python fan ever since I've known him and thinks John Cleese is the cheese. For those not familiar with the Fawlty Towers television series, it's a classic British sitcom from the 1970's starring John Cleese. Cleese plays a hotel manager named Basil Fawlty who is snobbish and often rude to the guests at the hotel. His incompetent staff and annoying wife round out the circus. It's the perfect farce and the hilarious series amuses my husband greatly. I've never seen the show but from viewing the YouTube videos, it does look like it could garner some good laughs. 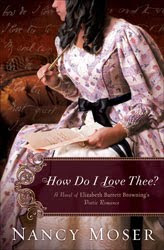 • Contest ends on Monday, November 16th, 2009 at 11:59 PM CST. 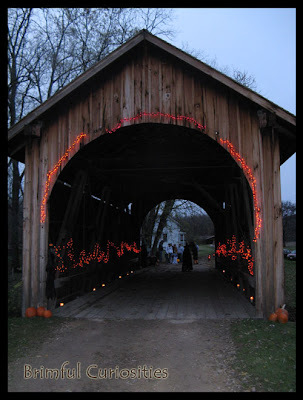 BOO to you! The kids wanted to read all about ghosts this week. Our selections from the library included a couple safe, not too spooky reads: The Teeny Tiny Ghost by Kay Winters, illustrated by Lynn Munsinger and The Berenstain Bears and the Ghost of the Forest by Stan & Jan Berenstain. 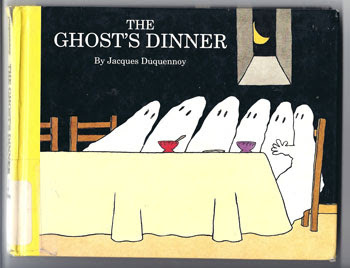 The overall ghost favorite, the one we have read multiple times every single day is The Ghost's Dinner by Jacques Duquennoy. Henry the ghost invites six of his ghost friends to his castle for a dinner party. He serves them colorful drinks and tasty food. The white ghosts change colors depending on what they consume. One drinks spinach juice and turns green. They all eat pumpkin soup and turn orange. (Some turn more orange than others depending on if they've taken seconds.) Eating salad makes them look leafy and eating cheese makes them holey. After a few other delicious entrees they start to wonder if they'll ever turn white again. This book is the cutest ghost book I've ever read. Both my toddler and preschooler simply adore everything about it. Even the end pages are interesting. When the ghosts arrive they are skinny and when they leave they have full bellies. The dining room in the castle has four windows and the moon moves from window to window as the night progresses. The ghosts magically disappear and Henry hides, teasing his guests. This book was originally published in France by Albin Michel Jeunesse. I'd really like to purchase a copy for our personal library. Unfortunately the book is out of print! Please, could some publisher reprint it? I don't think I can afford to buy a used copy. The Ghost's Dinner focuses on colors. 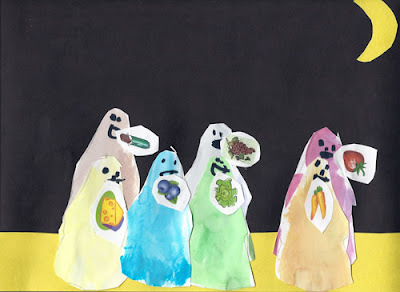 For our craft we painted ghosts using water-color paint. My daughter painted her seven ghosts seven different colors. I questioned her about what food would turn each ghost each of the seven colors. We searched the Microsoft clip art and found corresponding food to go along with each ghost. 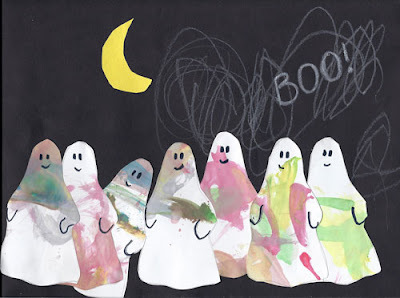 My toddler enjoyed painting multi-colored ghosts. Maybe they ate confetti cake? I've been trying limit my posting of winners to one a month. Here is the list of winners for October. As always, all winners have or will be contacted by email. After the initial email they have 72 hours to get back to me before another winner is chosen. (Click on the image to enlarge the Random.org numbers.) Thanks so much for visiting Brimful Curiosities. I appreciate your comments! The winner is Dolphin Girl (comment #54). The winner is Stephanie (comment #41). The winner is Ryan, Corrie, and Max (comment #113). The winner is Anonymous commenter frogz60 (comment #32). The 105th World Series begins tonight with the New York Yankees hosting the reigning champion from last year, the Philadelphia Phillies. We haven't watched much baseball after losing interest earlier in the season after the Milwaukee Brewers started performing poorly. But we'll watch some of the World Series play, especially tonight's game because former Brewer CC Sabathia starts on the mound for the Yankees. A while back Kaskey Kids sent us a set of baseball sports action figures called Baseball Guys. Today we took the Baseball Guys out of their box and set them up in preparation for a pretend play World Series game. The red and blue uniformed players work perfectly for the 2009 World Series. Plus, the set has made it easier to explain some baseball basics to our preschooler and has increased her interest in baseball. Who knows, she might even watch an inning or two tonight! 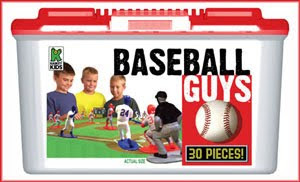 The Baseball Guys set encourages imaginative play. Just like those classic army men or the cowboy sets, the "Sports Guys" action figures are made of hard plastic. Each figure has a wide enough base so it stands up without falling over. The players are amazingly realistic and detailed with painted uniforms. Each player even has it's own separate number on the back of it's uniform. The figures are approximately 2-3/4" tall. The Baseball Guys set has won an iParenting Media Award and Creative Child Magazine Preferred Choice Award. There aren't any actual rules that accompany the set. 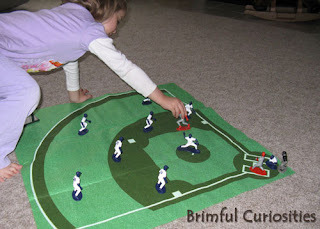 The instructions and playbook only provides a simplified explanation of the game of baseball. Instead, kids are encouraged to make up their own games and play freely with the figures without rules or guidelines. However, if kids need a few suggestions, the Kaskey Kids Website Kid's Corner includes a Ways to Play section. I think the baseball dice game sounds like fun. The website also shows images of the figures used as cake or party decorations. 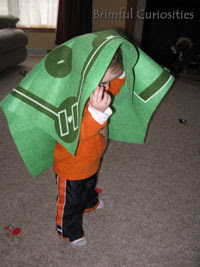 My favorite picture though is the Halloween costume of the little boy dressed as a football field. My daughter likes to set up her own games on the felt field. She also likes to count all the figures and line them up in a straight line. She especially enjoys playing with the set if Daddy joins in and pretends along with her. Unfortunately sometimes her toddler brother wants in on the action as well. His way of playing involves destruction by scattering all the players over the floor and running off with the field. Football Guys, College Football, Hockey Guys, Soccer Guys and Girls, and Mini Packs. My husband is a huge football fan and has his eye on the Football Guys: Green vs. Black so that he can set up his own Packer game. There's no Wisconsin team yet in the College line, but maybe in a few years the company will offer more teams. Sports directors and coaches have used the sports figures as training tools for their teams. Although girls can play with any of the sets, the Soccer Girls is marketed specifically towards girls and features ethnically diverse female players in pink and blue uniforms. To enter, leave a comment letting me know which "Sports Guys" set you'd choose if you won. Chronicle Books - Giveaway Ends ?? This past week the trees in our area hit peak fall colors. The red, orange, and yellow leaves are so beautiful. To celebrate the season we've mainly been reading books about leaves and fall. Here are a few books we checked out from the library: Fall Leaves Fall! by Zoe Hall, illustrated By Shari Halpern; Red Leaf, Yellow Leaf by Lois Ehlert; I Know It's Autumn by Eileen Spinelli, illustrated by Nancy Hayashi and The Little Yellow Leaf by Carin Berger. A simple but beautiful book about leaves and changing seasons. A little bear experiences his first autumn season and witnesses the leaves falling from the trees. Worried, he tries to fix the trees but the leaves keep falling. Feeling very tired he grabs armfuls of leaves and prepares to hibernate. Time goes fast as the seasons change from fall, to winter and finally spring. Falling leaves excite kids and this book provides an opportunity to explain the change of seasons to a young child. The illustrations so perfectly depict the fall colors and falling leaves that it feels like you're glancing out a window experiencing it all for the first time yourself. The kids thought it was funny that the bear tried to put the leaves back on the trees. 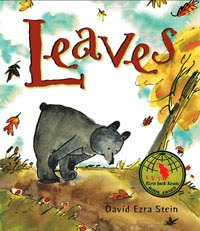 David Ezra Stein won the 2008 Ezra Jack Keats New Writer-Award for Leaves. 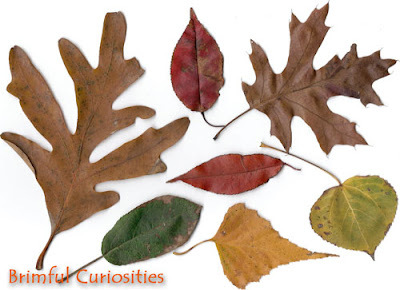 For our craft, we collected several different varieties of leaves and examined them close up. We scanned a few of the leaves on the computer to make a pretty digital collage. 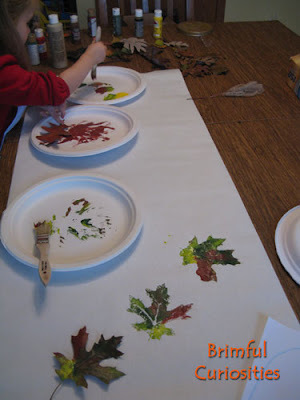 Next, we made leaf prints on freezer paper by painting the leaves with fall-colored acrylic paint and pressing each leaf onto the paper. Post what you've been reading each week with your kids at The Well-Read Child or Mouse Grows, Mouse Learns. A Mommy's Adventures hosts the "stART" meme (Story + Art) each week. Monsters - those furry, sometimes scary creatures are favorites of children. Seems kids can't get enough monsters. But here's a good question. What if monsters resided under their beds? What would those monsters look like? What kind of noises would they make? 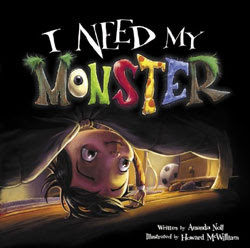 In Amanda Noll's new picture book, I Need My Monster, little Ethan has a monster under his bed, a monster named Gabe with sharp claws and a long, spiked tail. Ethan likes his monster. He needs his monster. His monster is just scary enough to keep him in bed at night and, after all, that is the point of having a monster. Unfortunately, Ethan's monster Gabe takes a vacation, and Ethan can't get to sleep. He ends up interviewing potential replacements but none of them meet his standards. He doesn't want a bow wearing girl monster or a monster with a ridiculously long tongue. He only wants Gabe. I Need My Monster shows off the silly and sometimes remotely frightening side of monsters in a fun, teasing way. Scary monsters, humorous monsters, refined monsters -- five monsters with hilarious names (Gabe, Herbert, Ralph, Cynthia, Mack) star in I Need My Monster. The book lends itself well to reading-aloud with silly voices because all the monsters have funny, interesting things to say. Even though the entire story takes place in one location, Ethan's room, artist Howard McWilliam illustrates the story perfectly, from multiple angles and perspectives. His creative images of the monsters capture and exaggerate their distinctive, often comical qualities. Luckily my preschool daughter has never been afraid of monsters. She knows that they aren't real but just pretend. 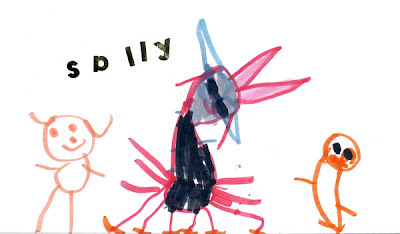 And actually my daughter likes most of the monsters in the book, all except for Gabe. He is rather scary and he needs to be to keep Ethan in bed. Most kids including my daughter enjoy getting a little scared, so long as they know that all will probably end fine. Author Amanda Noll pretty much knows how far to push the monster bit with kids (except maybe the toe-nibbling, feather pillow eating part). So, here's my advice. Kids that are already scared of monsters or might get scared of monsters should probably wait until they are a little older to read this one, until they can understand the humor. But those monster-loving children? After reading this book, they'll want a monster of their own under their bed. My monster would have orange feet, super sharp claws, and sharp, mighty teeth. It would have red hair (kind of short) and hundreds of legs and 600 arms, 2 sets of ears that look like a bunny and black fur. Sally is her name and she wears sunglasses. She eats rice, beans and chicken nuggets and chocolate cake for dessert. What does your under-the-bed monster look like? I'm not sure what mine looks like, but he needs my cat to keep him company! Quirky Momma - Book Giveaway Ends ?? Really, I'm up for a trip to the bookstore any day, but this looks like a particularly good weekend to take your kids to Barnes & Noble bookstores. On Saturday, October 24th, customers can get a free small cookie and kid-sized cup of hot chocolate. Print out your coupon using this link. On top of that, Saturday at 11:00 a.m. happens to be Halloween Storytime at B&N. Find out what your local store is planning. 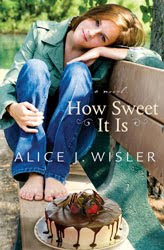 Want to know about current B&N children's book bestsellers? Books from the Diary of a Wimpy Kid series by Jeff Kinney top the list. And, no surprise here, Where the Wild Things Are by Maurice Sendak makes the list, most likely due to the recent movie release. Rainy days like today call for contemplative, quiet music. 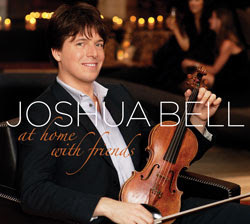 A violin and the pitter patter of rain make the perfect pairing, so our choice of music this morning was Joshua Bell's newest CD, At Home With Friends . In this eclectic compilation, several different performers like Josh Groban, Anoushka Shankar, and Sting perform separate pieces with the very talented violinist Joshua Bell. The inspiration behind At Home With Friends comes from Bell's own experience with home musicales, informal evenings when he gathers together with family or friends and plays all kinds of music along with his guests. Each track on the CD is as different as each of the performers, and the result reminds me of a crazy quilt of classical, jazz, pop and more. The patchwork of several different musical styles all blends together in a creative, free-flowing way to form an unusual but exquisite product. The first track on the CD, "I Loves You Porgy" featuring Chris Botti, is my personal favorite. The trumpet, violin and piano combine together in this reflective, soft, jazzy melody. Frankie Moreno's version of the Beatle's "Eleanor Rigby" caught my attention and intrigued me. (You can watch a performance of this song on YouTube here: http://www.youtube.com/watch?v=KSpuMkHAkUE). Anoushka Shankar's expressive sitar piece "Variant Moods" is full of rhythm and is simply mesmerizing. This CD will remain in my CD player for those times when I desire a relaxing, lyrical mix of music. On my way to pick my daughter up at the school bus stop on Monday I almost stepped on this little snake. It made me jump because it looked like a stick in the road at first but then started wiggling. I quickly ran back to the house to grab the camera and snapped a couple shots. I'm pretty sure the species is Brown Snake (DeKay's Snake). 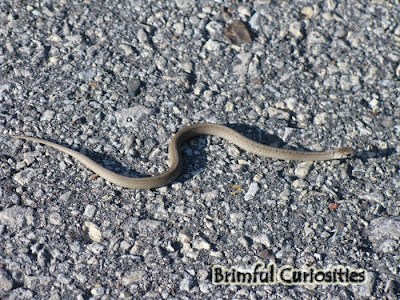 According to an article on the Milwaukee Public Museum website, "Brown snakes are often seen crossing roads as they migrate to or from their winter dens in May and October. They live in surface litter and under rubbish, stones and logs." The snake was still there after I picked my daughter up. My daughter kept her distance, but she wasn't too afraid considering the small size of the snake (they only grow 9-13 inches long). A year ago we found a snakeskin in our yard by the kids swing set. Now we have a good idea what kind of snake most likely left it there for us to find. Junkyard Fort by Jon Scieszka, and illustrated by David Shannon, Loren Long and Dave Gordon. Tea for Ruby by The Duchess of York, Sarah Ferguson, and illustrated by Robin Preiss Glasser. Sleepyhead by Karma Wilson and illustrated by John Segal. Ballyhoo Bay by Judy Sierra and illustrated by Derek Anderson. What's Under the Bed? written and illustrated by Joe Fenton. Ms. 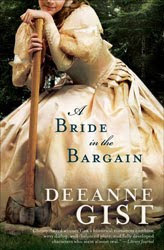 Bookish lists more book giveaways this week in her 10/18 giveaway edition. 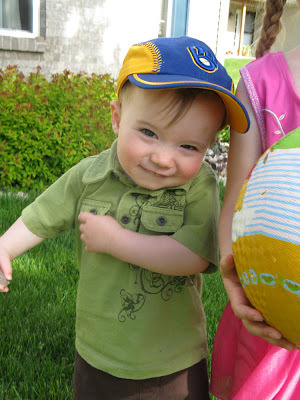 The first time my grandma saw my baby boy, she exclaimed, "His eyes are full of fun and mischief!" She got that one right. My little guy can be so darn sweet but there's always a hint of tease and silliness behind his adorable smile. 5 Minutes for Mom is hosting a Silly Kids Photo Contest sponsored by Hasbro. The prize: $1,000 to use towards classes and/or education material for your child. (Second place gets $300.00). Tomorrow is the last day to enter (10/19 at 3pm Eastern). 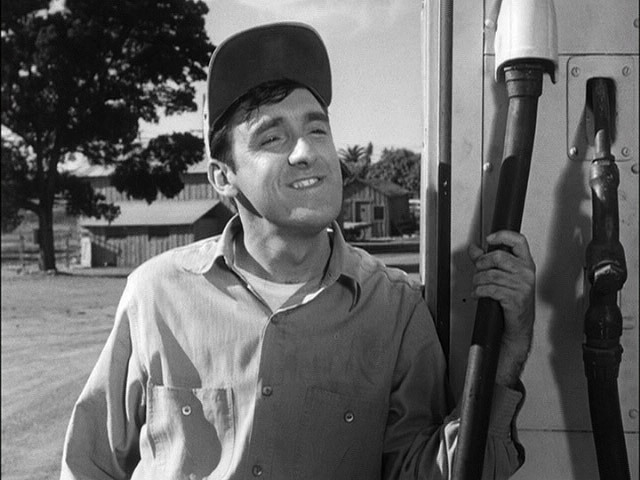 This picture of "A Little Gomer Pyle" is my entry. Ever since our children were born, my husband and I haven't really spent much time playing board or card games together. Sure, we play Candyland and Hi Ho! Cherry-O, but I'm talking about the games meant for kids older than five. I like playing games (especially if I win), an inherited trait from my father. We played a lot of different games growing up. I posted about my love of Rummy Royal a while back. That's the game that taught me about basic poker hands like a flush and a straight. My mom's favorite game is Scrabble, so we played that game quite a bit as well. Just recently I had the chance to review a new game called Rummino. The game combines aspects of Rummy with certain aspects of word tile games like Scrabble. Each player takes 7 tiles and then must play as many tiles as they can by adding them to runs (tiles in a sequence) or sets (tiles of the same rank). Each play is scored depending on how many tiles played and bonus points gained. The game ends when when one of the players runs out of tiles and the player with the highest score wins. The game consists of 92 tiles, a tile bag and an instruction sheet. (Best played by ages 8+ and 2-6 players). At first, I thought Rummino sounded relatively simple, but it does require quite a bit of thought and strategy. My husband and I sat down one night and tried it out. It took us a few practice times and several glances at the rules before we caught on. Once you get the hang of it though, the game gets easier. Like they say, practice makes perfect. Besides the normal suits (hearts, spades, diamonds, clubs) and colors (red and black), the game includes a star suit and the colors blue, green, and purple. The tiles are small, about one inch square each, but you'll need a little room to spread out. The game does not come with a board so the tiles are played like dominoes on a table or surface. My only complaint: I wish Rummino would have included tile racks like Scrabble. If you want to play on the floor the pieces won't stand on carpet, making it hard to hide your "hand." 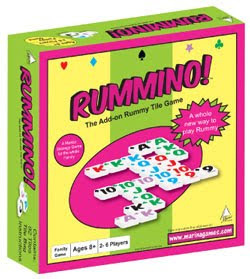 Those that like games of sequence and strategy will enjoy Rummino. I can't wait to play against my dad. Think he'll let me win for once?